Pet shop Gloucester new ranges in stock today. Following the trade show last week we now have some great new ranges in stock in our pet shop Gloucester. Today we have just put out onto the shelves a range of Pet Rebellion car, floor and feeding mats. These absorbant, all grip, no slip mats are sylishly designed to protect your floors and carpets from the worst exesses of your furry friends. There are aborbant food mats to catch the spills from the more messy eaters, barrier rugs for placing at entrances to stop the spread of muddy paw prints (sized for dogs or for cats to go by the cat flap) and car protectors to help make the boot lining last just that bit longer! We have checked our pet shop Gloucester prices and they are equal to or less than what you commonly find these for on the internet, so the price is right too. 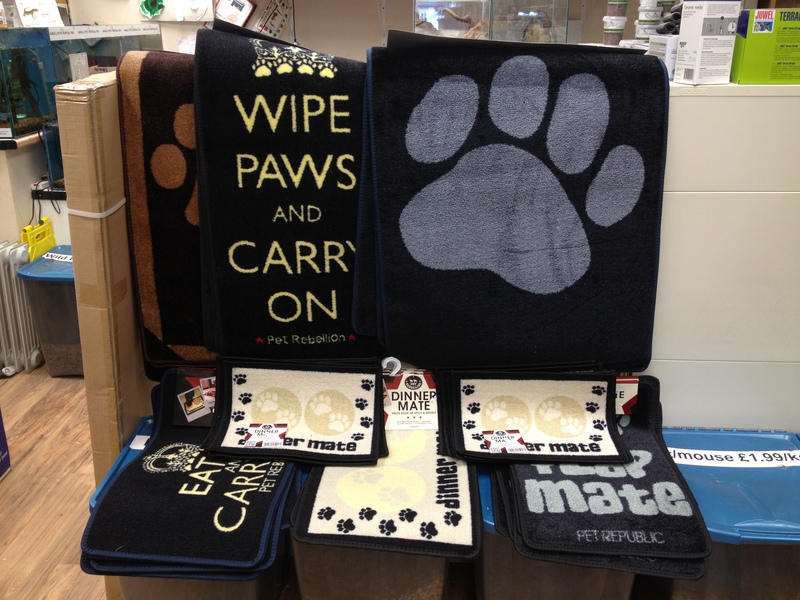 Pop into our pet shop Gloucester to have a look at these superb products and save your self hours of scrubbing floors and carpets or, if you are like me, save money paying someone else to do it for you! This entry was posted in Cat, Discount, Dog, Pet care, Pet Shop Gloucester Blog Roll, Sale, Uncategorized and tagged angell pet, angell pets, cat food, cats, discount, discount pet supplies, dog food, dogs, gloucester, gloucester pet shop, gloucester pet shops, pet care, pet food, pet food suppliers, pet food supplies, pet shop, pet shop gloucester, pets, pets for sale, pets shop gloucester by rangell. Bookmark the permalink.